Get the Solution for Radical, Positive Change! We need God today like never before! not only did I find out why I was miserable—I found the way to flip it for good! Don't worry, we will never spam your inbox. Do you feel stuck and can’t catch a break? Do you want to do something positive, but don’t know where to start? Are you shaken by current events, find yourself grumbling and complaining about your situation, and even feel disappointed with God? Are you suffering physically, emotionally or spiritually—but don’t know why? You can stop feeling paralyzed and move forward to blessings! Don’t Say Another Word Until You Read This! I don’t want you to miss it. I have the solution for positive, radical change! I discovered 4 Powerful Keys that changed my life! Want to hear some great news? I share this revelation in my free ebook. If you put it into action, it will change your life—for the good! Do you want radical breakthroughs in your health, finances and relationships? How about alignment with God That releases His promises and blessings? 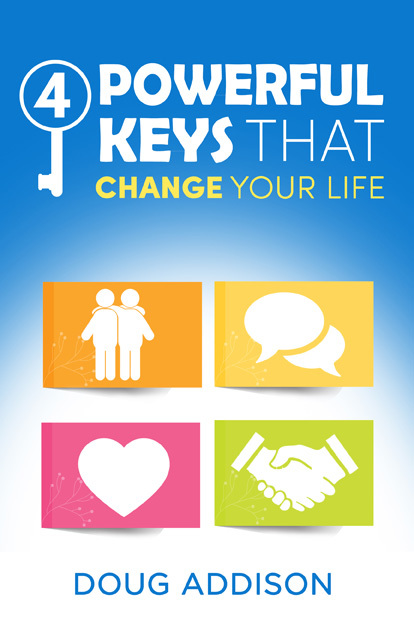 Get your free copy of 4 Powerful Keys That Change Your Life now! As a prophetic breakthrough coach, I have helped hundreds of thousands of people know God better and accelerate their understanding. I help people achieve breakthrough results! I will also show you how to break negativity and open the heavens so blessings will flow! You can radically change your life and release the blessings of God in your life—now—with God’s 4 Powerful Keys. Grab Your Keys! Download Now! Doug Addison is the founder and president of InLight Connection. Doug is a prophetic speaker, author and coach. He is best known for his Daily Prophetic Words and Spirit Connection webcast, podcast and blog. He and his wife Linda live in Los Angeles, California where they are impacting the arts and entertainment and media industries. Doug’s message of love, hope and having fun reaches people around the world! It's Time to Unlock the Change—For Good! © 2018 Doug Addison | InLight Connection. All rights reserved.